I’ve been to a baseball game before, and I know (roughly) how baseball works, but I’ve never actually played baseball. And so, I didn’t think that batting would be particularly hard. You see a ball coming towards you, hit the ball, and then run in a circle. Simple enough. I might even have a hidden talent, like that Japanese guy who can repeatedly slice baseballs in half. 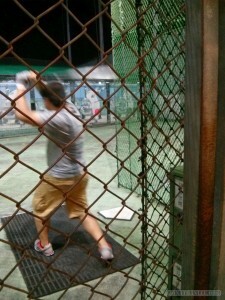 So with one of my cousins, I visited a batting cage. And thoroughly dashed my hopes of having a hidden talent for baseball. It’s kind of like Schrödinger’s cat. Before going to a batting cage, I exist in a quantum state where I am both good at baseball and bad at baseball. But then, when I open the box and actually try batting, my quantum state collapses and I’m either good or bad, but not both. And I’m bad. Really, really bad at batting.